San Sebastián won the Academy of Urbanism’s Award for European City of the Year 2016, and is also currently European City of Culture. A study tour backed up with fact filled presentations provided a unique chance of learning how the Basque Country, with just two million inhabitants and an economy based on manufacturing, has reinvented itself. Later travelling from San Sebastián to Bilbao, taking the metre gauge line that winds its way along the coast and through the mountains, we passed through one industrial town after another. The modern electric train stopped every mile or so, to pick up or drop off passengers. With strong similarities to South Wales, Northern Ireland, or even the Tyne Valley, there are some important lessons for our post-industrial cities. As Republicans during the terrible Spanish Civil War (Guernica incidentally is the Basque town that first experienced what bombing can do), and with its own language and culture, the people of this mountainous region have had to struggle to survive. Rich mines were tapped for heavy industry, and produced a strong working-class movement. The Spanish Queen’s discovery of sea bathing in 1842 made San Sebastián popular with the rich. Its border location gave it the trappings of a French city. But the movement for Basque separatism ETA, which led to some 700 deaths, as well as the industrial decline of the 1980s – which caused Bilbao’s shipyards to go bankrupt – required a new image or identity if tourism and employment were to flourish. So San Sebastián has become a creative dynamo. Housing densities are high because building land is scarce. This supports lively bars and shopping areas, and social cohesion, as well as some of the world’s best restaurants. While some have emigrated to find work, the mass of people have long links with the area and their neighbours. Only 7% are immigrants. The cultural programme is built on community engagement, and big projects, such as the conversion of an old tobacco factory into an arts centre, provide spaces for a great diversity of cultural interests. San Sebastián’s many neighbourhoods are surprisingly equal in terms of income and deprivation levels, as well as life expectancy. Unemployment at 10.6% is less than half what it is in the rest of Spain (26.1%) Though the population is getting older, a programme for Active Ageing under the theme +55, seeks to engage everyone. Cultural Houses, such as libraries, and innovations such as ‘human libraries’ help young people discover what old people know. Unlike the UK, manufacturing still predominates. The Cooperative group of Mondragon plays a key role, with some 75,000 employees, and includes major industries like CAF, which is a leading producer of light and heavy rail equipment. High levels of investment in R&D (2.7% of GNP) keep firms competitive, and yield some of the highest productivity levels in Europe. Since 2005 the strategy has been to promote science and innovation. The key is ‘smart specialisation’, within a series of ‘clusters’. Instead of selling companies to foreign investors, and using the sites for warehousing or retail, local economic development has been fostered. A City wide development agency (Foment), founded in 1902, has a regular income from owning the principal hotel in San Sebastián. It has a 7.8 million Euro budget, and supports 2,600 SMEs as well as working in partnership with some 70 other bodies. The main Technology Park, which is part of the World Alliance for Innovation, is part of a group of three which employ some 16,000 in 429 companies. Significantly it owns a third of the buildings. It has been developed on land owned by one of the regional Savings Banks which was previously only used as a country park. While San Sebastián has a population of 185,000, there are 435,000 living in the Metropolitan area, so good communications are vital. Half the residents live in hilly areas, and a first-class public transport system is therefore essential to avoid congestion and pollution. Cars have been excluded progressively to create a ‘sustainable, safe, healthy and friendly transport system’. There is a 100% Electric Bike sharing service, and the main technical university is trialling driverless electric buses as part of a European consortium. Traffic has been taken out of the main streets, and parking has been put underground. As a result the city centre is compact and highly walkable. The extensive ‘Old city’, which due to fires and wars largely dates from the 19th century, is packed at night with people strolling from bar to bar. The bars compete in the quality of the ‘pinchos’ (or tapas) they offer as snacks, and which form an excellent meal. Streets are used flexibly, for example by allowing parking on them at night. The two sides of the City are connected by a new underground Metro line, and the current 2 kilometres is being extended to 30km. Old tunnels through the hill that divides the two parts have been turned into a cycle route. A new bus station has been built next to one of the railway stations. Though the three main cities compete for investment, there is also close collaboration, supported by the Basque Parliament, and regional financial institutions such as the Savings Banks. 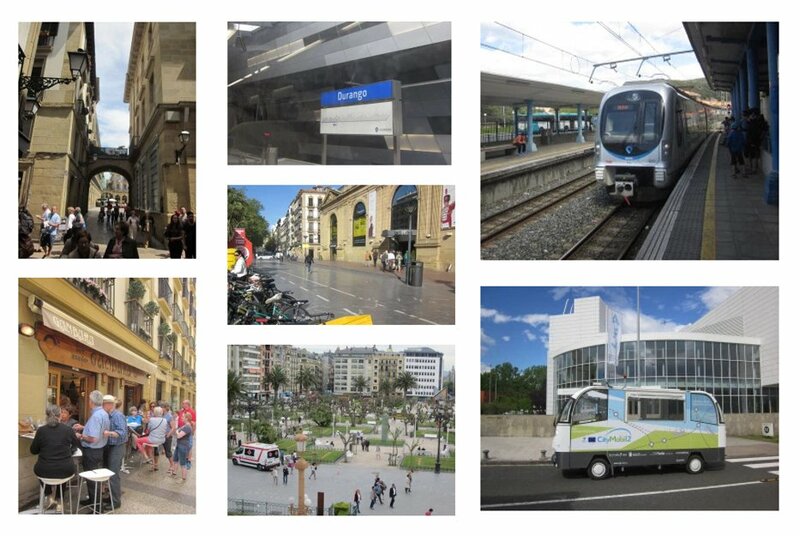 The successful transformation of San Sebastián (and other Basque) cities is the product of progressive local authorities, backed by a regional government with substantial financial autonomy. The City had the same Mayor for twenty years, and it was he who applied for selection as European Capital of Culture (only to lose out to the opposing party in a subsequent election!). A good example of the City’s role is the development of the main Technical University, which has some 16,000 students. The City developed its own MasterPlan, (after rejecting one from the Krier Brothers), based on a series of large blocks around courtyards. It acquired the land with a long-term loan. Sites were sold off within briefs on 70 year leases, which specified, for example, a mix of private and social housing. A better known example of a proactive approach is provided by Bilbao, which lost its main industries in the 1980s. With advice from British consultants, the City took over the land, using non-payment of municipal taxes as the excuse. Sites were then developed within briefs, the most notable being the iconic Guggenheim Gallery. Though it is frequently said that Frank Gehry’s building put the City on the world tourist map, in fact it only came about though municipal enterprise. It was the City who funded the £100 million building, and had already started the transformation of the banks of the River Nevion, including an underground Metro system designed by Norman Foster’s firm. The Academy of Urbanism’s study tour not only reinforced San Sebastián’s credentials as a great city, with a great team of municipal officers, but also highlighted the economic potential of medium sized cities (150-250,000). The secrets appear to lie in combining investment in local infrastructure with imaginative and well-designed development. But it is the underlying drive for social cohesion that underpins their economic success, not a reliance on either private markets or monuments to public aggrandisement. There are many cities in the UK in a similar position who could well benefit from adopting similar practices. This article was originally posted on Postcards from the Future. Read the original article.